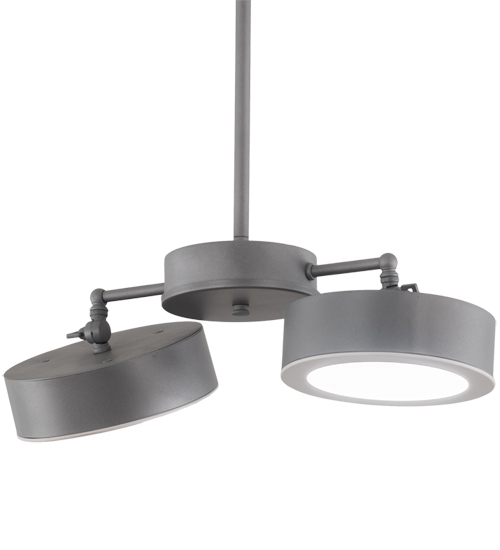 Description: This two light pendant features dual adjustable puck styled heads that deliver direct functional illumination on the surfaces below. This ceiling luminaire projects light with proprietary integral LEDs for energy savings, robust lighting, and long lasting life. The frame and hardware are featured in a Weatherable Silver finish. The overall height of this pendant ranges from 46.5 to 115 inches as the stem length can be easily adjusted in the field to accommodate your specific lighting application needs. Custom crafted in our 180,0000 square foot manufacturing facility in Yorkville, NY. Available in custom sizes and finishes. UL and cUL listed for dry and damp locations.